There are a few modifications of the original techniques described by Latarjet. The technique shown below is that described by Walch & Boileau , which is a modification of the original Latarjet procedure. A self-retaining retractor is then placed between the pectoralis major and the deltoid, completing the operative exposure. The coracoid is divided at it's base, with the coraco-acromial ligament and the conjoined tendon. 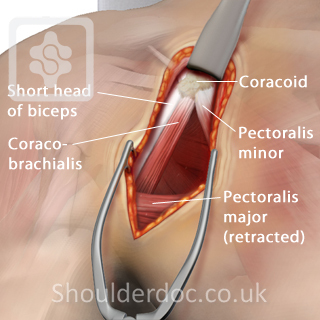 Pec minor is released from the coracoid. A micro sagittal saw is used to decorticate the deep surface of the coracoid process, and two holes are drilled in the coracoid process perpendicular to its long axis. The scissors are oriented vertically and opened, exposing the underlying capsule. 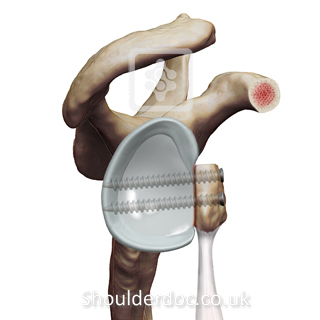 Vertical capsulotomy is preformed to expose the joint. Complete exposure of the anterior inferior glenoid rim. 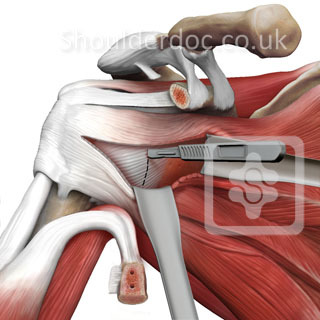 The humeral head is retracted laterally. The glenoid labrum and scapular periosteum are incised, creating a u-shaped incision for the coracoid process to lie on. 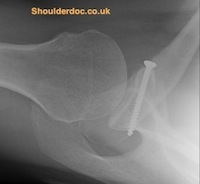 The coracoid is fixed to the rim of the glenoid. 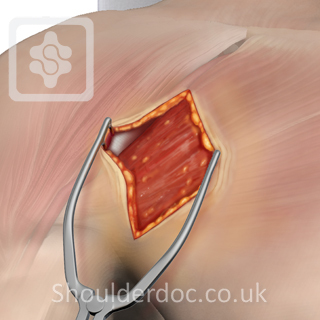 The final position is shown below: The coracoid is fixed to the front of the glenoid and the coraco-acromial ligament is used to reinforce the joint capsule. 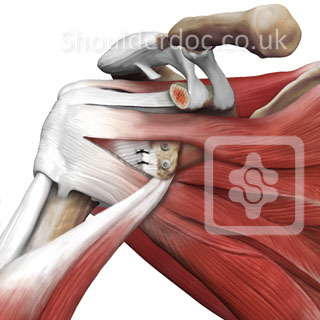 Preoperative view of the shoulder in abduction and external rotation. Postoperativew view of the shoulder in abduction and external rotation after the Latarjet procedure. When the arm is lifted overhead (abducted and externally rotated), the transferred muscles over the subscapularis act as a muscular strut or restraint, preventing dislocation of the shoulder joint.